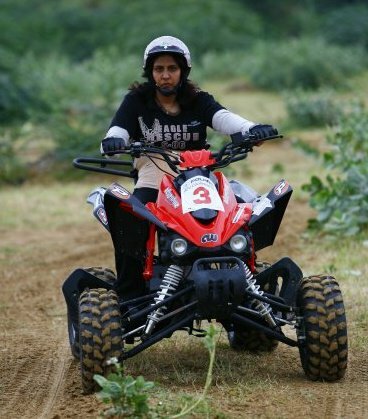 DEEPA MALIK is not remarkable because she is an army officer’s wife who loves bikes. Nor is it uncommon for a 42-year-old parent to love high-altitude driving and swimming in rivers. While it is amazing that Malik does these things without her legs. 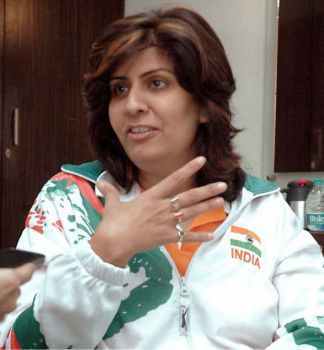 Deepa Malik is an Indian swimmer, biker and athlete. She is a paraplegic. She has won numerous accolades for her participation in various adventure sports. Deepa Malik belongs to an out and out Army background; she is the wife of Colonel (Retired) Bikram Malik, who served the Armoured Corps in one of the oldest regiments – The Scinde Horse. In order to devote full attention to his wife, he sought voluntary retirement soon after finishing command of his regiment in 2006. Deepa’s father Colonel (Retired) BK Nagpal served with the Grenadiers, yet another prestigious Infantry regiment of the Indian Army. Her father-in-law, Major General (Retired) BS Malik commanded the same regiment as her husband – The Scinde Horse. Deepa was born a normal healthy child in 1970; in 1977, she suffered from tumours along the spine and recovered after surgery and extensive physiotherapy. She got married in 1989 but her condition started worsening once again in 1989. She underwent two surgeries in the Army Research and Referral Hospital, rated amongst the best in the country, but did not recover and was paralysed from the waist and below.It was a tough time for Malik family. Her husband Bikram Singh Malik was fighting the Kargil war and at home Deepa was struggling with her tumors. Finally the family won both the war. India won Kargil. Despite three spinal tumour surgeries and 183 stitches between shoulder blades, she came out a winner and has never looked back. Deepa has a very severe international disability category termed as F53 which covers chest below paralysis. Her condition translates into complete paralysis below the chest with zero sensation in the afflicted areas, no bladder and bowel control, half the lungs inflated, poor body temperature control and blood circulation and no torso balance. Only her arms and shoulders are functional but three spinal surgeries and about 180 stitches between her shoulder blades in upper spinal region making long sitting, training and driving with arms more challenging. In addition, she has to continuously undergo tumour management treatment which is extremely draining in health and energy. Right from the word go Deepa was not ready to allow her disability to come in the way of leading a normal life. She tied ropes all along below the roof in the rooms of her house and performed household duties, looking after her husband and two lovely daughters. She also created a successful business at Ahmednagar in Maharashtra, where her in-laws had built a house and were living post retirement. Ahmednagar is the training centre of the Armoured Corps and has a large presence of the Corps fraternity. At the age of 36, Deepa felt that she had to do something more to fight her unfortunate condition and for this she started looking towards sports and motivational activities. In less than six years, she has become an international sports person. 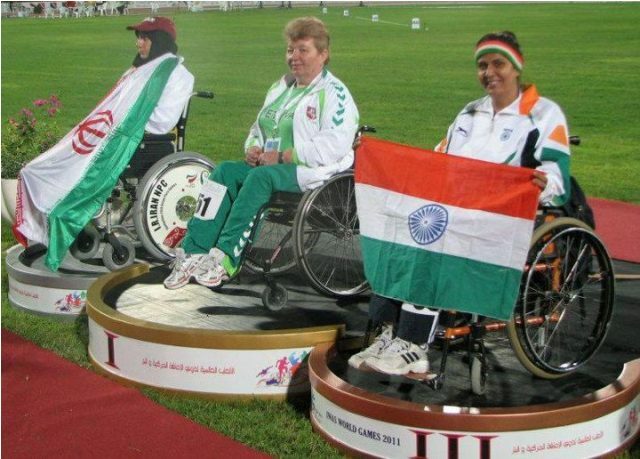 She has won 39 Gold, Four Silver and two Bronze medals at the national and State levels apart from being the first sportswoman to represent India at the international level in her category of disability. In 2010 her world ranking, in her category of disability, was second in Shot-put, third in discuss and third in Javelin and Asian ranking was first in all three categories. She is also the first paraplegic woman biker and a car rallyist.In March 2010, she successfully completed the very difficult Desert Storm motor vehicle rally; a journey of almost 3000 km through breath taking desert landscapes and the toughest terrain, an unprecedented feat of endurance and courage. Whether it is swimming against the strong Yamuna current, or riding a special bike or even taking a shot at the Paralympics, she has done it all. She is a Limca Book record holder for feats of swimming, biking and driving. 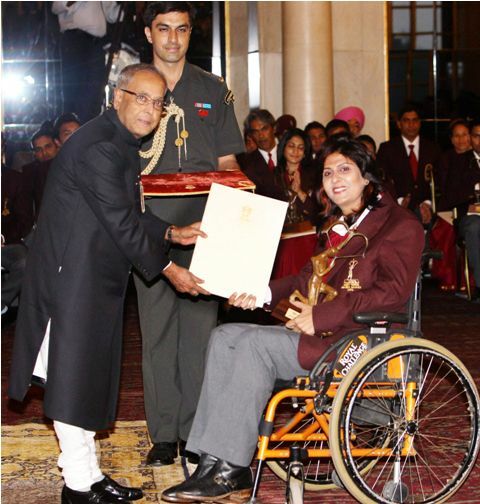 The President of India, Shri Pranab Mukherjee awarded Deepa Malik with the Arjuna Award for Athletics (Paralympics) during the National Sports Awards 2012 held at the Rashtrapati Bhawan on Wednesday, August, 29, 2012. This coveted award recognises excellence in sports. The gritty athlete was greeted with the loudest applause as she went forward to accept the award.